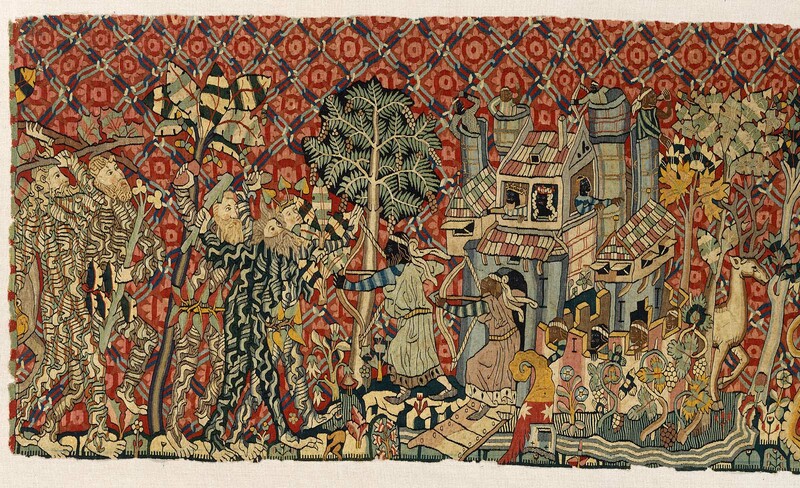 Series of scenes (left to right), wild men attacking Moors in castle, wilk men fighting with lion, dragon, and unicorn, and wild men carrying food to wild woman with two children seated at foot of rocks; stylized trees, plants, rocks; stylized trees, plants, rocks; pinkish-red background covered with roses in two shades of pinkish-red, frames by diamond lattice formed by links of chain, blue, darker blue, and white. In lower part of tapestry, right half, a shield divided horizontally, upper half yellow with two red roses with blue conters, lower half black (Blümel, Alsace), same arms appear as manteling on helmet lower center of tapestry. On far right helmet surmounted by ibex horn with mantling red with two white stars (Zorn, Strassburg). Human faces woven without features, which are painted, possibly originally embroidered, some embroidery stitches survive. Weaving finished so back and face almost identical, except for faces. Colors include very dark blue (almost black), several shades of blue, green, yellow, orange, pink, red, and grayish violet. According to a letter from Peter Kempf, Director, Fürstlich Hohenzollernsches Museum to Jean-Michel Tuchscherer of the MFA (September 25, 1984). See F. A. Lehner, Fürstlich Hohenzollern'sches Museum zu Sigmaringen: Verzeichnis der Textilarbeiten (Sigmaringen, 1874), p. 4, cat. no. 2. Georg Swarzenski, "Der Verkauf der Sigmaringer Sammlung," Zeitschrift für bildende Kunst 11/12 (1928-1929): 277. 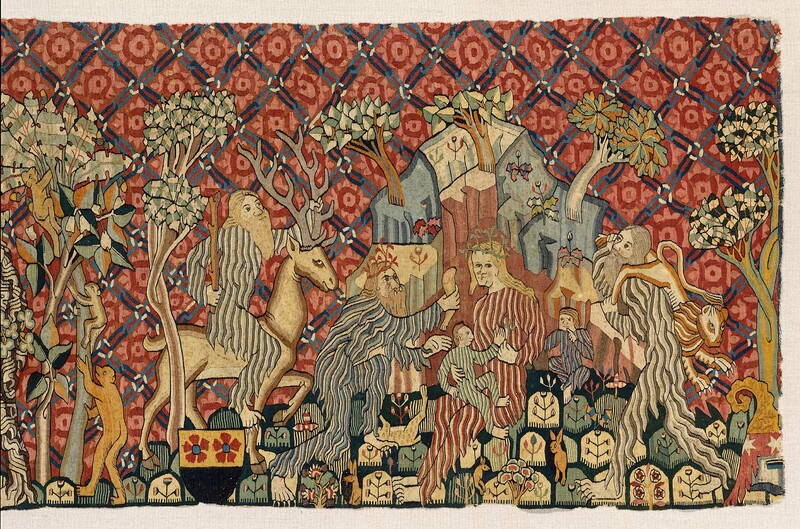 The tapestry was exhibited at the Städel in 1928; see Kurzes Verzeichnis der im Staedelschen Kunstinstitut ausgestellten Sigmaringer Sammlungen (Frankfurt, 1928), p. 100, cat. no. 1125. See Elfi Pracht, "Ottmar Strauss: Industrieller, Staatsbeamter, Kunstsammler," Menora: Jahrbuch für deutsch-jüdische Geschichte 1994, p. 69, n. 50. Before fleeing Germany for Switzerland in 1936, Strauss sold most of his art collection in a series of auctions in Frankfurt. 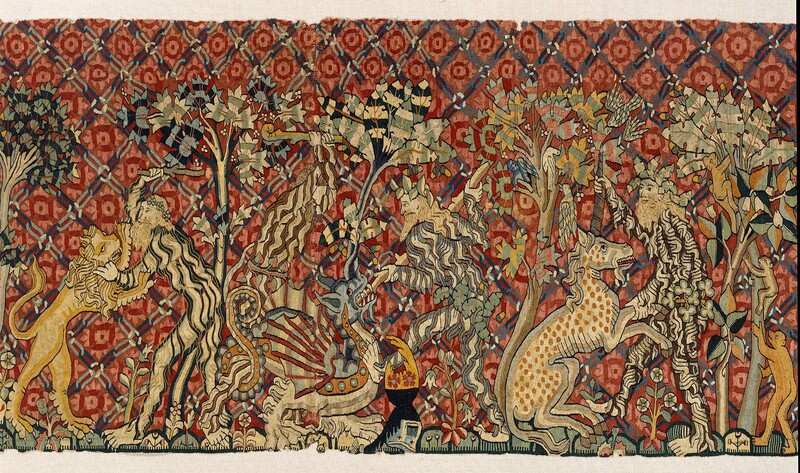 This tapestry, however, remained in his possession. Hermann Goering was interested in acquiring the work, but it remained in a Cologne bank vault throughout the Nazi era. At his death, Strauss bequeathed the tapestry to his grandson, Stephan Kronenberg (see Pracht 1994, as above, n. 4). When the tapestry was sold in 1954, it was through the family's company; Westra had been founded as the Ottmar Strauss Corporation in 1950. Strauss's son, Ulrich, was president; Paul Weiden was his attorney.